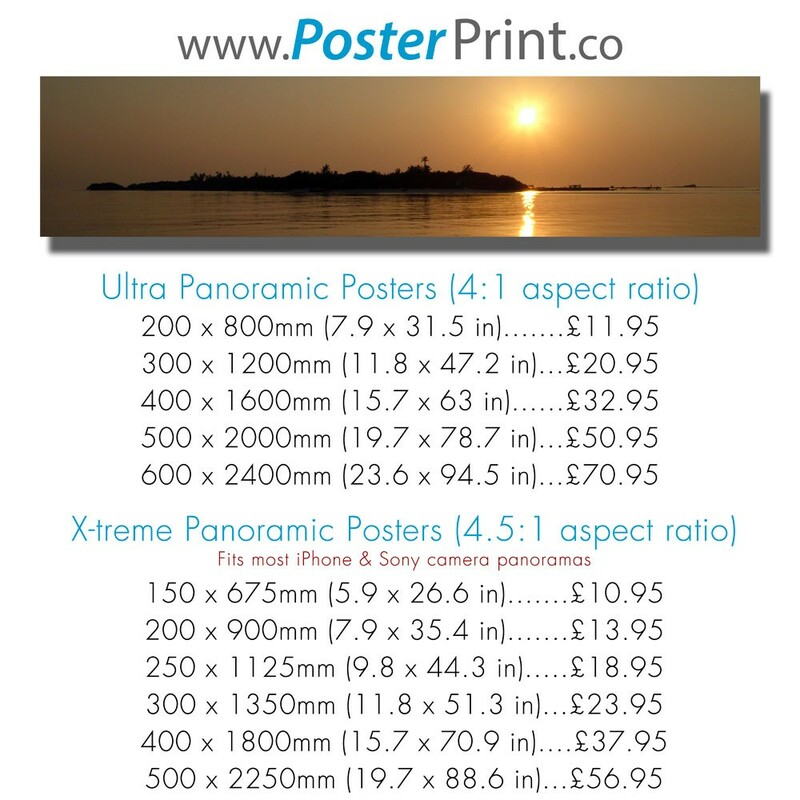 Panoramic prints - Panorama photos into stunning panoramic prints with vibrant colours. Panoramic photos from your iPhone, camera or mobile into beautiful poster prints. Fast despatch, wide range of sizes. Photos can be enlarged for beautiful panoramic posters of your best photographs. Our prints are the perfect option for creating unique wall art. High resolution panorama photo printing, stunning quality large prints, fast service. Panoramic print photo posters preserve your favourite memories. Your photos can be enlarged for beautiful posters of your best photographs. Our prints can be the perfect option for dressing up your home or flat. Simply upload photos from your iPad, iPhone, mobile device, pc or mac, our web tools will do the rest. See our article with advice to help you print panoramic photos. If we have any queries on your order, such as the quality of your photo, we will contact you via email before proceeding to print. Panoramic photos come in a wide range of sizes. Cameras and software today allow you to create beautiful, artistic panoramas. We are happy to print these into posters if possible, whatever the size! If you are unsure what size of panorama to order for your composition, our website will do the work for you. Simply upload your picture and select through the various size ranges. Our cropping tool will show you a preview of how your image will look when printed. When you are happy with the crop, simply select your required size and paper type - as easy as 1…2…3 ! If your image does not fit into the selection of sizes we offer on the website, please feel free to email us attaching the image. Simply let us know approximately what width or height you would prefer, we will email you with size and price options. 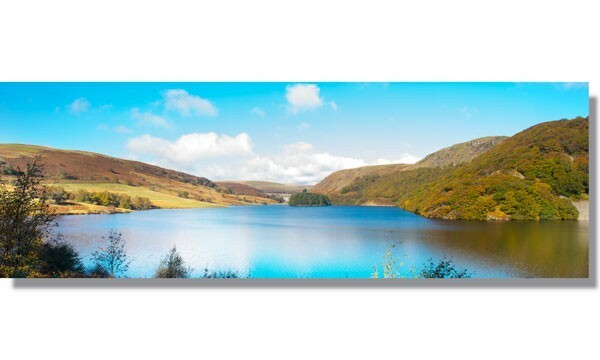 If your photo is wider than the sizes offered here, why not see our extra wide panoramic printing. Our sizes are based on a varying range of aspect ratios; the higher the number, the wider the panoramic size. We start at a basic Panorama (2:1 aspect ratio) and progress to Super Panorama (3:1 aspect ratio). Next in line is our Ultra Panorama (4:1 aspect ratio) followed by X-treme Panorama (4.5:1 aspect ratio). Simply upload your favourite images and select through the different size ranges until you find the one that best suits your photography. All of our ranges offer a selection of sizes so you can choose from a small print to massive wall art. If you would like to understand more about how panoramic sizes work, why not take a look at our article on aspect ratio. If you prefer dynamic framed wall art we also offer a picture framing service. Why not look at our panoramic prints framed service. Simply upload your picture; we will print, frame and ship your custom made framed print, crafted to your personal specifications. Alternatively, see our panoramic prints on canvas for a high quality canvas print, hand-framed on natural redwood pine bars. Our website will normally upload and create a thumbnail for photo files up to 200Mb. However, occasionally photos will have difficulty due to internet speeds. When this occurs, please see our file upload help page . We can accept jpg, jpeg, tif, and tiff please contact us if you have any difficulty. Panoramic Photo Poster - Better than imagined! Panoramic photo poster - Just wanted to say thank you for all your help with the print. It arrived yesterday and we love it! It is so much better than I ever would have imagined! Our second panoramic picture printed with you guys now and both are amazing quality, would highly recommend and it came pretty much next day! Thank you! Panoramic photo prints. 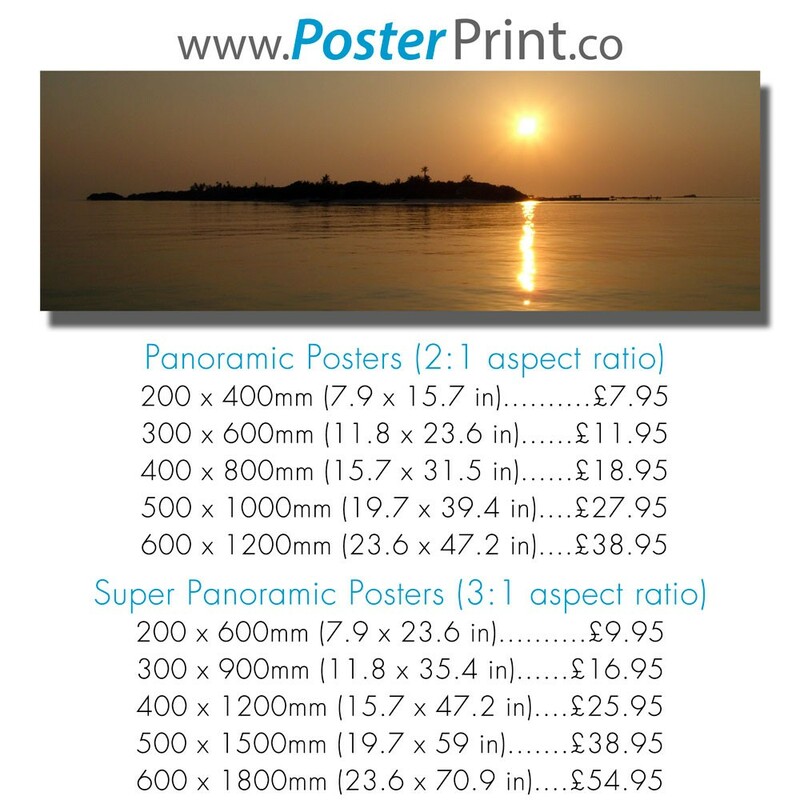 High quality panorama print, faithful reproduction, easy interface and speedy delivery. Thanks. Panorama photo printing - Brilliant! Panorama photo printing - It’s arrived and it’s brilliant. Thanks. Top job. Panoramic posters, prints. Top quality print with a very fast delivery. Pleasure to use. I'll definitely use this service in future. Amazing service!! Panoramic print ordered, processed, and delivered within 36 hours. Excellent quality at extremely low prices. Very pleased. Super quick service with quality to match. Just received poster print of an old panoramic school photo. It was cracked and light damaged but was section scanned,stiched in photoshop and repaired. The print is stunning ! Thank you. Fantastic service, Quality prints at a really good price. I'll definitely be calling again. I decided to purchase a print of a very special panoramic photograph taken with my iphone to see how well the photograph would turn out when printed at larger scale. the print was sent to me within 24 hours. The quality is stunning. the colour and paper quality is excellent. I have since printed off 2 further panoramic images which are also top class. Much higher quality large panoramic prints than I ever thought possible. Been seeking quality poster printing from PDF - now found them!! I have been trying to find someone who could print from PDF files, with no success, UNTIL NOW!!! Sent files for 2 200x900mm panoramas on "day 1" and they arrived on "Day 3". A-MAZ-ING!! Not only that but they were PERFECT. YES - I will be using them in the future and can recommend their service to anyone. The prints have arrived and I am very happy with them. Easy to order and choose the correct size for my image too!! Easy to use website it let's you see how your print will look if it needed cropping before you order it. Received order in just 2 days and excellent quality. Absolutely thrilled with the quality of the print! Never expected my panoramic image to look as great as it did because it was only taken from a camera phone, but so impressed with the quality and will definitely order again. Great service and fast delivery, very happy! Fantastic quality, arrived very quickly - updates via email - very happy with the service and will definitely order again! Fantastic quality and price. Arrived very quickly too. Absolutely first class service and quality - thank you! Delighted with print. Excellent service and price. I was very happy with the service. I had emailed with a number of enquiries and the people at Poster Print were very helpful. They sorted a bespoke print size, which was excellent quality, together with a frame. The order arrived quickly. Excellent value for money and a fantastic service. Perfect, just what I imagined. My poster arrived - its amazing, thank you! Ordered a panoramic print and was emailed the next day by a lady advising me that my photo was not the best quality. Sent over another photo and received the poster the next day. Brilliant quality, brilliant value and brilliant postage!! First time using this sort of service so didn't have high hopes, but quality was brilliant and came next day. Amazing quality!! Was a bit wary at first because it was an iPhone photo blown up so big but the quality could not be better. The service was super quick too! Definitely be using again!! Hi there, I ordered a poster from you two days ago, it has just arrived. All I would like to say is that I'm absolutely over the moon!! The speed in which it arrived and the quality of the picture! I'm extremely impressed and will definitely be using your company again! Quick delivery, good quality print. Highly recommend. Have frequently used this company and never been let down. As usual quality and speed of delivery are exceptional. I absolutely love my print. I've been looking for the right company to print it and I'm so pleased I came to poster prints. The colour is beautiful and the quality is superb. It was delivered much faster than expected and very good packaging. Will use again. Thank you. Absolutely delighted, will definitely be using again. Very pleased with print quality and excellent service. Wouldn't hesitate to use again. Fantastic prints. They are great quality and the speed of the service is brilliant. Have used before and will definitely use again. Brilliant service, print came very quickly and was just what I wanted. Excellent quality at a fantastic price. There was a problem with my data file, but Poster Print were great in helping to resolve the issue. Amazing quality. An excellent purchase. I received my order today, very pleased with the quality & the speed of service. I have often wondered about getting panoramic prints & now I have seen the results I will definitely use you again in future. Thanks. A very impressive set of panorama prints arrived back very quickly. They received a lot of justified praise and now are framed. Certainly will use your service again. Thanks. Very quick delivery and very pleased with the excellent quality print. I will definitely be using again. Excellent service and a good quality print. Really pleased with the service and speed! The quality is really good too. Was slightly put off initially by the payment method, especially as there wasn't any confirmation that it had been received and matched with the online order, but would certainly recommend that anyone with the same reservations go ahead and let the quality and speed of service speak for itself. Fantastic service. Much better results than I had expected. They looked carefully at how to get the best results, suggested some changes and delivered 2 great panoramas. I have ordered a few panoramas in the past and went larger this time for a special occasion, outcome and print was exceptional I will stay with the larger format all the time now, fast delivery and well packaged, nothing bad to say all good. Absolutely brilliant as usual. Would never dream of using any other company so good are these prints. Very happy! Gorgeous artwork from an old smartphone! Always use this company and never been let down. Very quick delivery and prints are great quality. Ordered Sunday, delivered Tuesday. 150 X 675. Superb Quality. Thank you. Super quality print and really fast and friendly service. The colour rendition, contrast, sharpness and resolution of detail are all spot-on. 100 x better than anticipated! Just to let you know the prints arrived safely yesterday and they are absolutely super. Thank you so much, they are 100 x better than we were anticipating and are so pleased with them. Can't wait to get them mounted and on the wall. Looks better than it does on the computer screen! A nice vibrant print on decent quality photo paper. Well worth the price. Definitely getting some more. Great quality print, arrived quickly, looks fantastic. Thank you! Very pleased with the quality of the print and the fast and efficient service. Excellent progress updates via email. Terrific quality, great speedy delivery. Very happy with the final product. Will be using again and recommending to others. Fast, versatile, professional service, highly recommend! First class in every respect - many thanks . My next order is on its way. Fantastic service! The photo arrived within two days of ordering. Very pleased with the quality too and look forward to using this company again in the near future. Thanks. Very pleased with the picture, first time using iPhone to take this style of picture. Great service & will use again. Just to let you know my poster print arrived safely this morning and I am absolutely thrilled with it. I will certainly use you again and will recommend to everyone I can. Wonderful service - advice on photo quality, sizing and cropping all given within 12 hours of request, photo printed and delivered next day! I cannot recommend the team highly enough! Really pleased with print. Definitely use again!! Just received my panoramic print today. Very pleased with it. Very fast delivery, very good quality, well done very impressed. Excellent. Better than I had actually expected. Would recommend. Thank you for your brilliant service, quality print and arrived in good time too! I am impressed not only with the quality of the print but the speed of processing and delivery. Ordered processed and despatched on the same day! Brilliant. Thank you, my husband for whom I bought the print, is impatient to have it framed and up on the wall. I have just received the print today and wanted to drop you a line to say it looks great! Many thanks for your help with getting the correct size. Very useful advice on choosing/changing sizes and formats. Ordered Friday, arrived Saturday. I would like to say thank you for your great service. Very fast correspondence and personal advice. Great service, good quality product. Slightly pricey compared to some others. An excellent overall service. This was my first panaromic print from my new camera. I spent some time searching the internet for the right place to try. Oh boy, did I choose right??? Great responses to my questions, very competitive price, very prompt delivery and a fabulous photo at the end. I took up the offer to upload my photo for it to be checked for the correct range of prints. Got the answer the next day. Service after that got even better with the quality of the print and the speed that it was processed - beat the local photo shops hands down for service and price. Very impressed with all aspects of the service I received..... Lightning quick responses to my emails, help choosing the right size and aspect, and 24 hour delivery of a high quality print. lovely better than I thought it would be! !